Because cold and wet weather plays hell with any body parts that aren’t insulated. And when it does you’re on dangerous ground: reactions get slow and tiredness quickly engulfs you. It’d be impossible to control a bike with gloves that are two-plus inches thick – unlike your upper torso – so heated grips are excellent at stopping your hands from freezing. 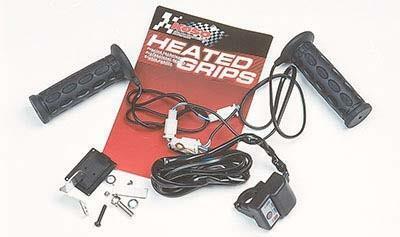 Today’s modern heated grips look no more out of place on a bike than the seat. A pair of replacement handlebar grips made of rubber and laced with wire elements. 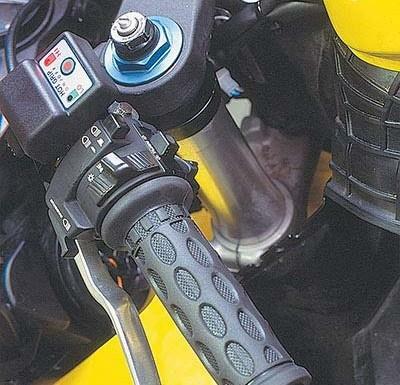 Both grips wire directly to the bike’s battery, sometimes with an electronic thermostat in line to control the temperature range. …You have panic attacks about fitting a three pin, 240v mains plug, or a phobia about working for more than an hour. 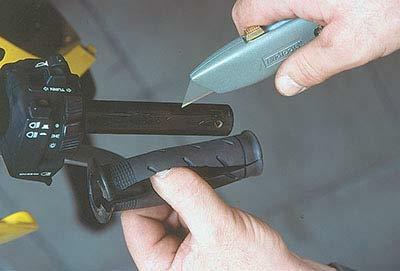 A sharp knife and contact cleaner to cut and remove the old grips. 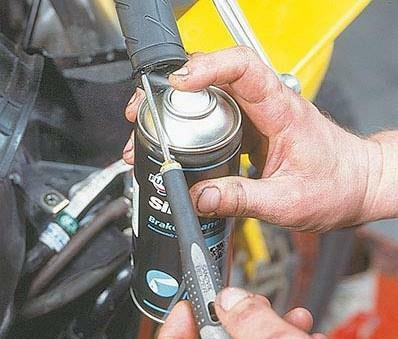 A tin of contact adhesive if the heated grip kit doesn’t come with any form of glue to fix the new grips in place – or hairspray works jut as well. An assortment of combination spanners (ideally 8-19mm), or Allen keys 5-10mm to remove the fuel tank and hide the wiring. 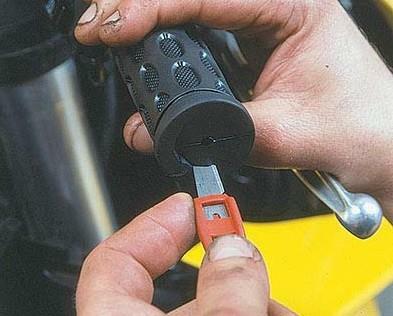 Phillips (cross-head) or Pozidrive screwdrivers to remove handlebar end-weights and loosen the battery terminals. 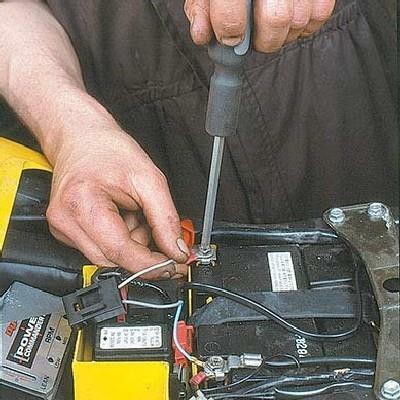 You might slash, or glue, your hands together, blow a fuse by wiring it all up to the wrong terminals… but only if you attempt the job while drunk. 2. Remove the bar end-weights with a precise fitting screwdriver – the screws are soft glued in place and need a fair bit of muscle to undo. Retain both screws and weights to use again (the weights are used to dampen out vibrations). The soft glue on the threads remains fairly pliable so there’s no reason to buy any more. 3. To remove the left hand grip simply slice along its length, peel apart and pull off. You need to remove all signs of the old retaining glue and bits of rubber by spraying with contact cleaner or white spirit and rubbing clean. As a fall back use the missus’ nail polish remover. 4. 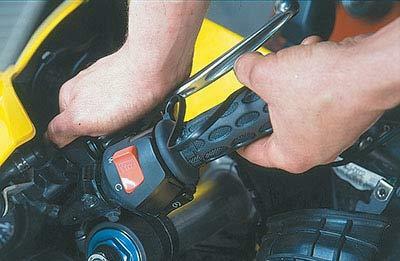 Care is needed to take off the old throttle grip. 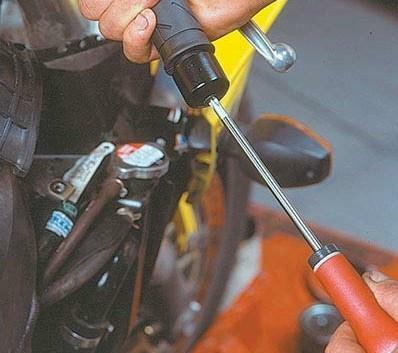 To prevent damage to the throttle tube, insert a thin screwdriver between the grip and tube and gently lift. There needs to be enough room to spray contact cleaner, or pour white spirit between them. This breaks down the glue and, after wiggling the screwdriver, the grip should just pull off. 5. With the bars squeaky clean, apply contact glue evenly around the length of the bar (only do one bar at a time). Apply with a metal screwdriver as it’s easier to wipe clean. 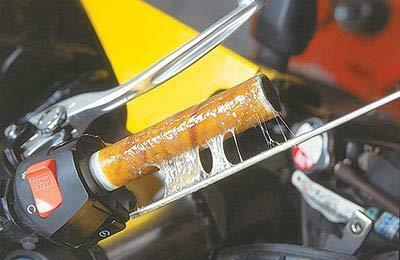 Be careful not to get any glue between the throttle tube and metal handlebar. Remember to use the bigger diameter grip on the throttle side. 6. Ease the opening of the grip on to the bar and wriggle or push the grip into place. Don’t crease the grip because you could damage the wire elements within it. Make sure the grip is butted up against the end of the handlebar. 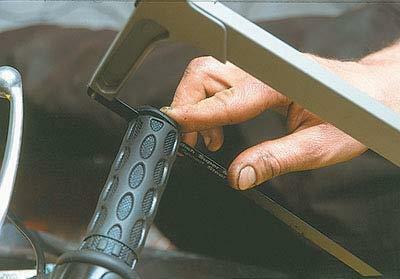 Repeat the same glue application and fitting technique to the other bar. 7. 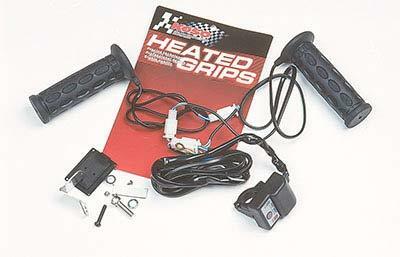 When ordering heated grips ask if the grips come with open ends so the bar weights can be put back on. Don’t worry if they don’t because it’s easily sorted. Carefully cut a small penny-shaped hole in the end – what you don’t want to do is to accidentally cut through the grip and completely bugger up the wiring. 8. With the same care, enlarge the hole with small cuts to make it bigger until the metal bar can be seen. You might have to make this hole slightly bigger so the grip doesn’t rub on the bar and the throttle can be opened and closed freely. The left bar isn’t so critical – just lop off the end of the grip with a hacksaw. 9. More cutting may be involved when it comes to refitting the bar end-weights. As their screws are tightened and the weights locate into place, the grips may get in the way. In the case of the throttle grip this could interfere with the smooth opening and closing of the throttle. 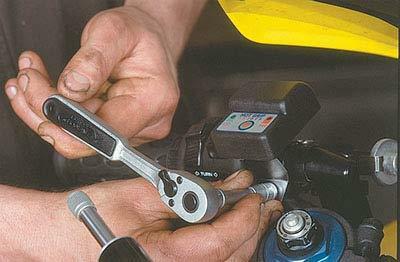 WD40 or grease between the throttle tube and bar will help. 10. The thermostat switch needs to be mounted within easy reach of a gloved hand. For switches with brackets supplied fit to the bars. If it is glued or Velcro-mounted try on the upper fairing lip near the tank, or on the clock surround. Cable-tie the wiring neatly along the bars so they don’t rub when the bars move. 11. Access the bike’s battery – usually under the seat. If the wires cannot be fed under the tank you’ll have to lift it slightly; get a friend to hold it up. Connect the wires directly to the battery with the right polarity as per the instructions. All wires and the inline fuse need to be held in place with tape or cable-ties. Refit the tank. 12. Before anything else retrace your steps and ensure all fasteners are done up tight. Now, with the engine running to save flattening the battery, switch on the heated grips. Turn the heat range to maximum and soon you’ll have toasty fingers. Then turn it down to minimum just to make sure the system works correctly. Bliss.